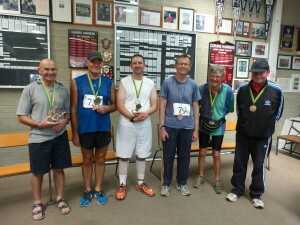 On Sunday March 10 I competed in the Coburg 6-Hour Walk race. It was my first 6-hour event, so my time 0f 43.266km was a PB. 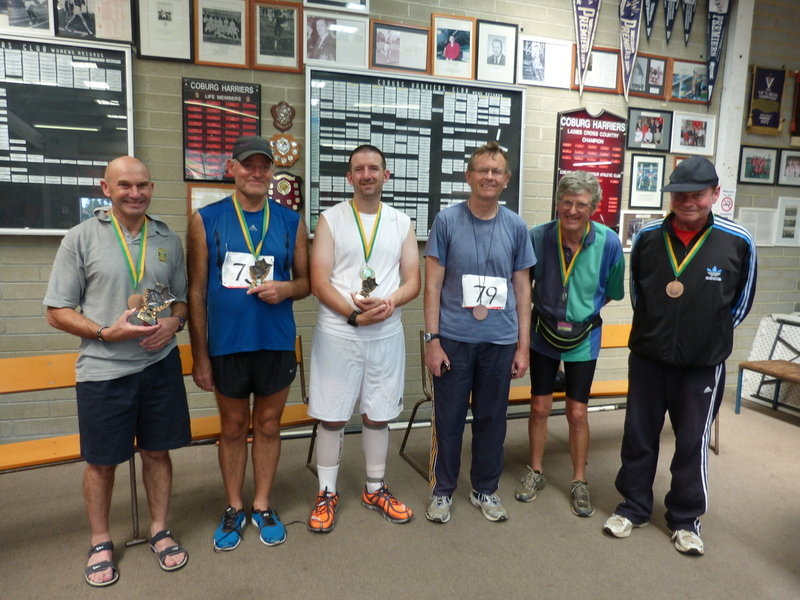 It was also good enough for third place behind Victorian walkers Terry O’Neill (50.5km) and Steve Jordan (46.1km). I was delighted with my result and achieved all my aims for the race. The 6-Hour was held early on a Sunday morning, the original 8 am start being moved forward two hours to 6:00 due to very hot weather forecast for that day. The time change was a good move, as it was 35 degrees C by the end of the race at noon. I worked all day Saturday with my normal teaching at the Jazz Workshop. I got a taxi to the airport for an 8:30 flight down to Melbourne. There I stayed in the Parkroyal Hotel at the airport, which is comfortable and convenient. Very early the next morning I got a cab to the Harold Stevens Athletics Park in Coburg, about a 20 minute drive. The track seemed pretty quiet in the predawn darkness, but before long more and more runners and walkers arrived, many with support crews in tow. There were also lots of bustling volunteers from the Coburg Harriers, hosts of the event. I arrived about an hour before the start and the time flashed by alarmingly quickly. By the time the prerace briefing was done, it still felt like a rush. Oh well, I hoped the rest of the day would also seem fast. There were nine entrants in the men’s walk race, with late withdrawal. There were three in the women’s walk race as well as twenty three runners in the 6-hour run which was held concurrently. The runners use lanes 1 and 2 and the walkers race in lanes 3 and 4. Walker’s lap distances are adjusted to account for the extra distance per lap (about 414 metres instead of 400). 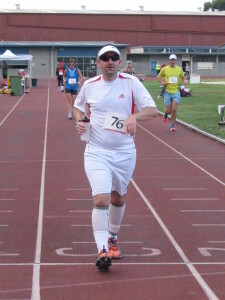 My aim for the race was to walk more than 42km within the 6-hour limit and, if possible, to finish in the top 3 walkers. The top 3 would of course depend on what other walkers did, but judging by the previous and recent form of the others it looked like I had a reasonable chance, so long as I walked above 40km. As normal for me, my start was slow. Lap 1 was ok, 3:06, but I was still way down the field. No matter, because there is no point getting caught up in the early adrenaline and testosterone rush. However, the other thing that I suffer early in every race is shin pain. It goes after a while, but really slows me down. It wasn’t until lap 12 that I was able to get under 3:30, which is about the minimum for a 40+ km time. After that I only had seven laps over 3:30 until lap 97 when I did another seven slower laps 3:34 up to 3:47. My final complete lap, 104, was 3:28.
was way down in the field, but quickly moved up to third and stayed there for the rest of the race. Winner Terry O’Neill walked extremely quickly with a powerful racewalking action. Steve Jordan, who came second, has an ungainly-looking action but is very strong and moves quickly. However, without question the standout walker of the day, as usual, was Victorian Michelle Thompson who won the women’s race with an Australian record distance of 55.865 km. Her slowest lap was 2:56, a terrific walker. 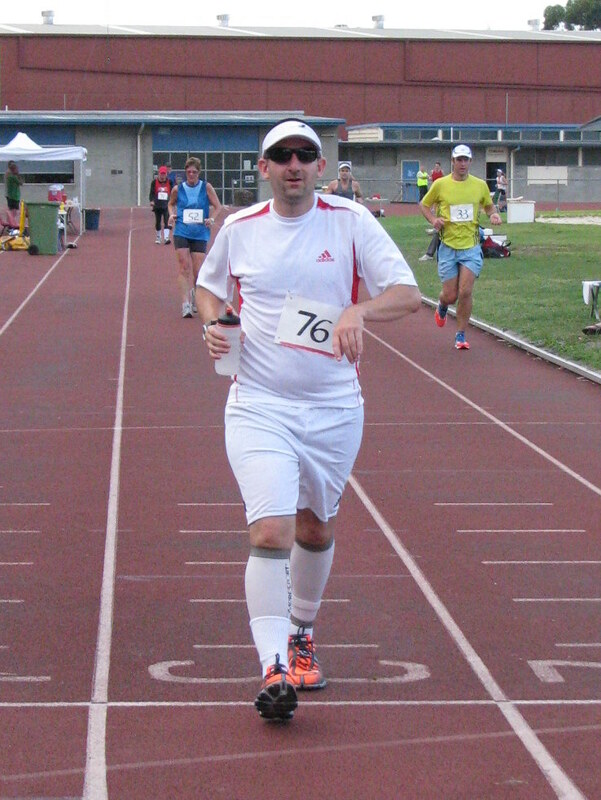 So, my final total of 43.266km was good enough for third place, as I’d hoped, and above my target of 42 km. My first trophy too! I was happy and in a good frame of mind for my preparations for the Coburg 24-hour race in mid-April. ← Nonstop walk Sydney to Yarramalong: trip report.